I was consistent with my listing the first half of the week, and then I got wrapped up in a big project which diverted a lot of my attention at the end of the week. 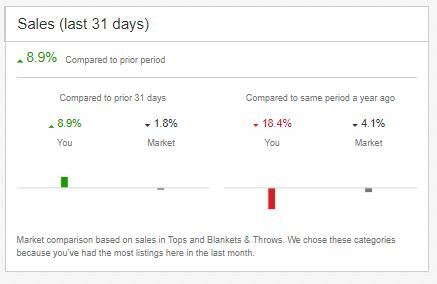 Last week I listed 37 new items, for a total of 567 listings since June 1. My 31 day sales are actually up, for the first time in weeks. Which actually just emphasizes how crummy my sales were in July, because you can see my sales compared to last year are still down by a lot. At this point I *think* that this will be a less hectic week, and that I should be able to re-focus on my eBaying. But, you know, summer. So we shall see. Yay for listing! Thanks, that makes me happy to hear. I’ve actually feeling kinda silly that I made this huge goal and that it’s looking like I will miss it specacularly. But then again, I know I’ve been more focused because of it and I am further along than I would be otherwise. So it’s still working. I am enjoying summer and don’t want it to end! When my boys go back to school my schedule opens up a lot which means I will be back to my “real” job. Another person is retiring and they still haven’t replaced the person who retired in May, which means I will probably be working pretty much every day. Which is good and bad, but means I will have a lot less eBaying time in the fall. One more reason to try and get a bunch done now! You might miss your goal, but aren’t you so much farther than you might have been without it? That what I love about goals…at least they motivate us a bit. Do you like working at the library every day? Is it worth your while? If so, than that’s okay. You’ve got a decent sized inventory that will continue to sell even if you don’t have that much time to put into ebay.